Dad and Tom are taking a break from the house for the next several days to haul peas to an elevator we contracted to over 2 hours away. Not to worry; I have several days of progress to catch you up on while they are busy. 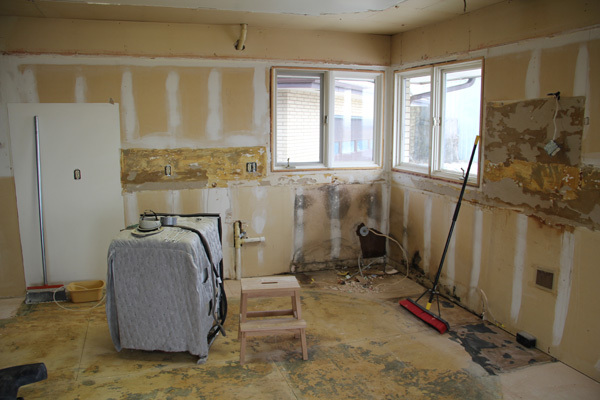 When you remodel you never know what problems you will uncover. Some of them create extra work, but in the end it feels really good to know what is hidden in your walls is clean and new. 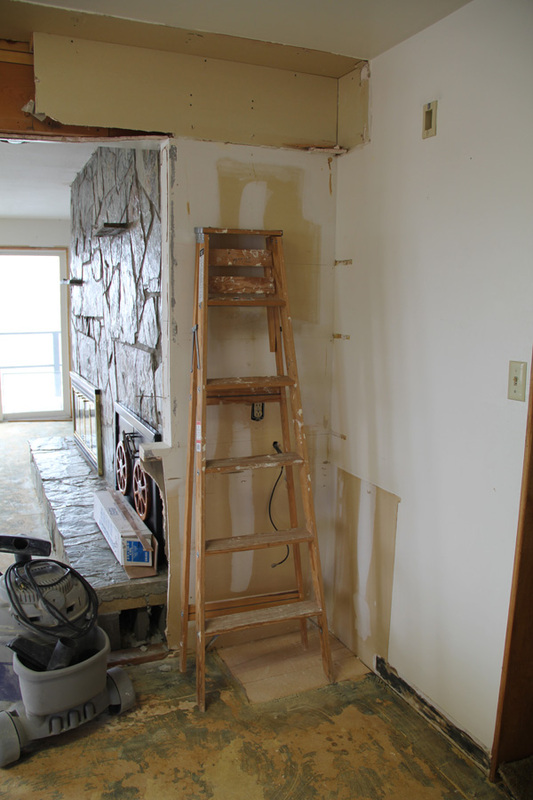 When the cabinets and soffits were all torn out, we were able to see structurally what we were dealing with. We knew ahead of time we were probably going to uncover this support beam right in the middle of the kitchen. Unfortunately the beam is about 12" high. If it had been smaller I may have covered it in better wood and stained it to make it a feature. But as it is, we are going to sheetrock it and paint it white (same as the ceiling). It intersects the island, but we can still put our island pendants on this side of the beam and center them over the whole island. This next pictures shows the corner where the desk used to be. Removing it exposed an unfinished edge to the fireplace, but it shouldn't be too hard to cover it up with something. Yummy. 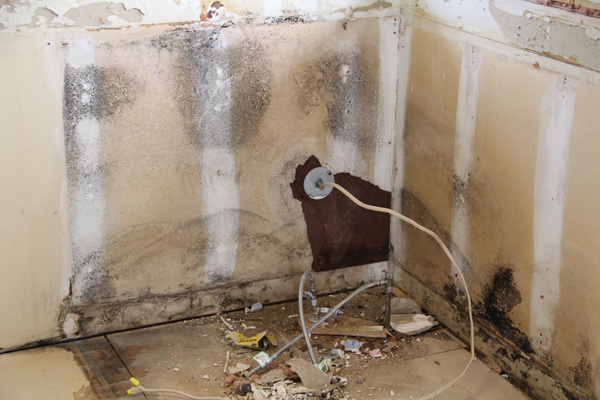 Yep, that is mold behind the sink area. In this wall a drain vent pipe broke through the sheetrock (and the cabinets) in two places. What do you think might enjoy access holes like this? You guessed it—mice. The lower cupboard that had this pipe protruding into it often held evidence of mice droppings. Ewww, I know. 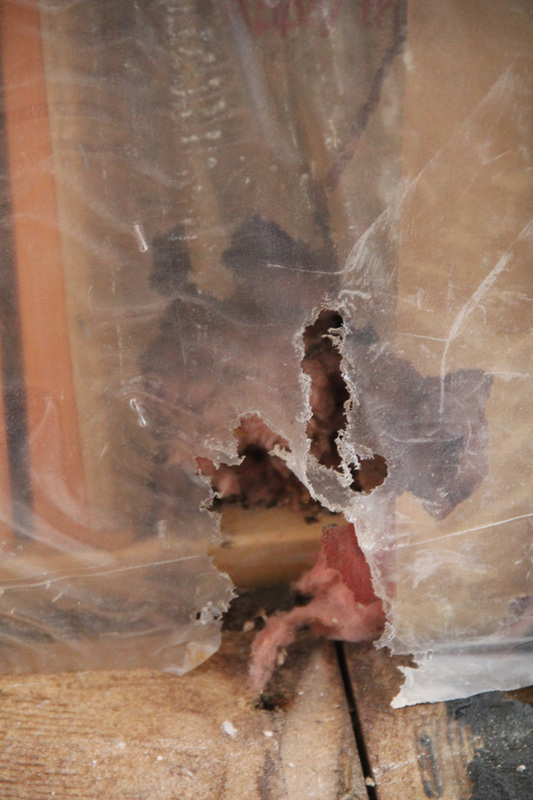 A mouse once chewed a hole in the seal on my crock pot lid. That cupboard door never would shut properly either, and I actually once WITNESSED a mouse run inside of it. From that point on there was a trap set inside the cupboard, but I never actually caught one there. Plenty of mouse chewing evidence behind all the cabinets—sorry friends. 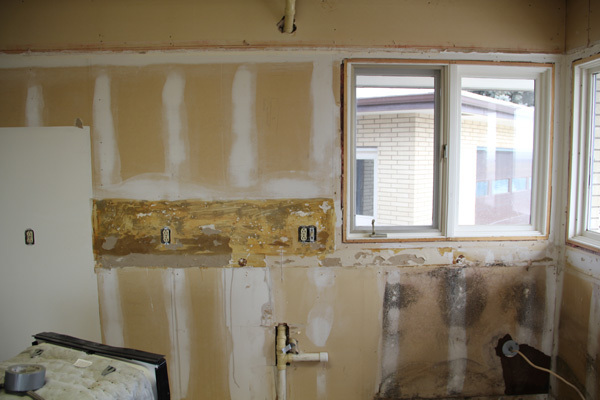 At this stage of a remodel the pictures aren't pretty. 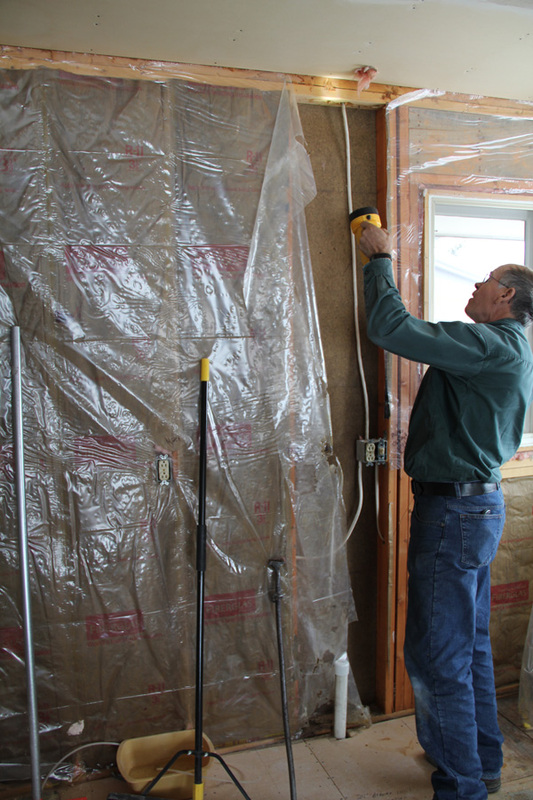 Here my dad is figuring out how to relocate that vent pipe inside the wall. 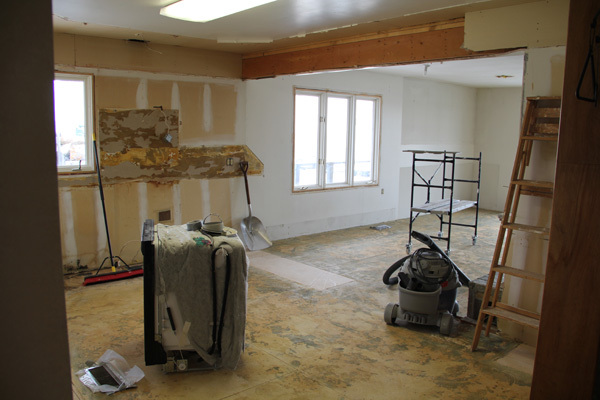 The popcorn ceiling is gone! 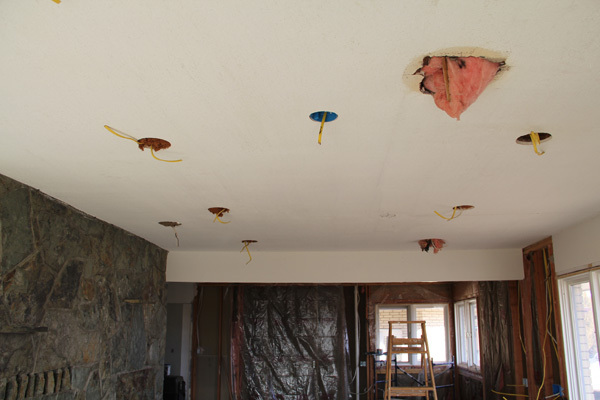 We will be texturing the ceiling before we prime and paint. They have also been cutting holes for new can lights. This job wasn't fun. My dad is the one who climbed up in the dirty attic space to run the wiring. 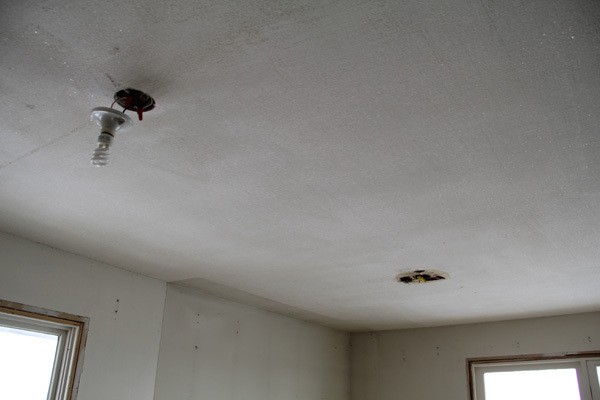 Attics in homes with shallow roofs like ours have very little space and lots of loose insulation. It wil all be worth it though—the old dining room lighting was much too dim and the light wasn't centered over the table. The old kitchen lighting was partly from soffit lighting (which we tore out) and partly from a too-bright overhead florescent light. The new cans (on dimmers) will be soft and bright and will supplement pendants over the island and the chandelier over the dining table. The old lighting holes will have to be patched. The plumbing and electrical work is almost done. 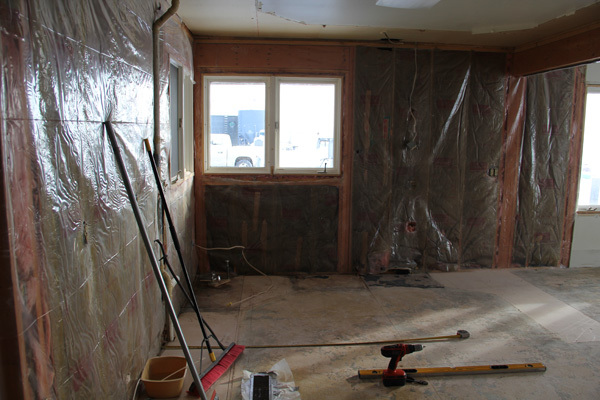 Next on list will be sheetrock work and tiling!